Keller Williams NYC today announced the launch of Chart Room, a new website feature powered by real estate data provider UrbanDigs that provides consumers with real-time market data. Buyers and sellers can access Chart Room directly from the Keller Williams NYC website to view available inventory, median days on market and the price per square foot, all of which is updated every 24 hours. 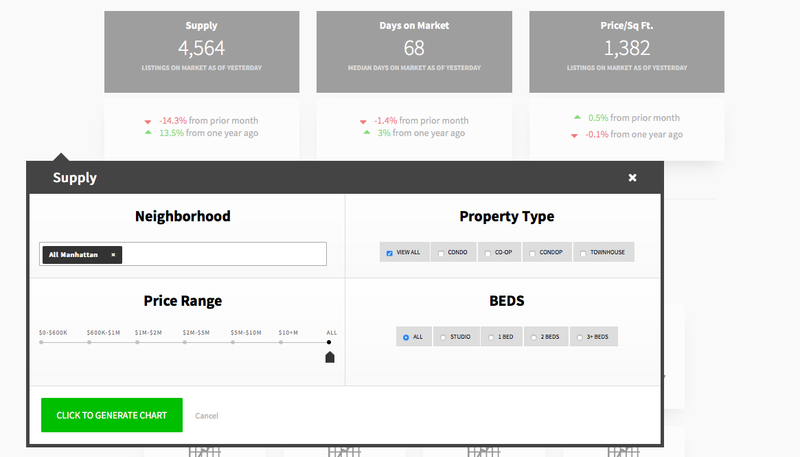 For a more targeted view, users can click the desired market indicator and create a downloadable chart for neighborhoods’ property types, price ranges and number of bedrooms. Currently, UrbanDigs only offers data for Manhattan and Brooklyn neighborhoods using information from the Real Estate Board of New York’s centralized syndication feed RLS (Residential Listing Service), ACRIS (Automated City Register Information System) and proprietary models, explained Rosenblatt in an emailed statement, but there are plans to include Queens. How to create a personalized chart. Beyond offering personalized market data, Chart Room also features KWNYC quarterly reports that include an overview of the NYC real estate market, the median sales price, days on market and sales pace for various housing types as well as a Manhattan neighborhood breakdown. KWNYC co-owner Ilan Bracha says the development of Chart Room is due, in part, to a lack of multiple listing service (MLS) data in New York City.